You have to have the inside story when the likes of the Daily Telegraph again pushing the propaganda, the alleged choice between acting Commissioner Ken Moroney and Small. Carr want's people who are totally corrupt working along side him. His idea? To corrupt our government policies. Nice bribe with Ryan in fact I am sure that bribing a police officer carries a reasonable sentence in itself. How about mandatory sentences for corrupt politicians? Those who have a greater onus to uphold the law and set an example for the wider community. Those who know better in terms of their education. That is except when it comes to greed. SMH April 12 2002 Stephen Gibbs reports "Then as we came into the Olympics something went wrong. And I do not know what that was". Says Doctor Weatherburn. That period leading up to the 2000 Games is the time Mr Ryan has been accused of "taking his eye off the ball" in areas including Cabramatta and other suburbs in Sydney's south-west. The opinion from Mr. Tim Priest and the Police Board is that dangerous people still lurk at the top of the Police Service. The NSW Opposition pushed for the former policeman's reinstatement because of new allegations of drugs and gang activities in schools in Sydney's south-west. Shadow Police Minister Andrew Tink says when Priest last year aired allegations of gangs recruiting school students to the drug trade, they were dismissed, SMH 25 March 2002. Priest knows who the dangerous police are. Then why has nothing been done except for lining them up for the top job. Questions like. Who was pushing the green light on heroin? 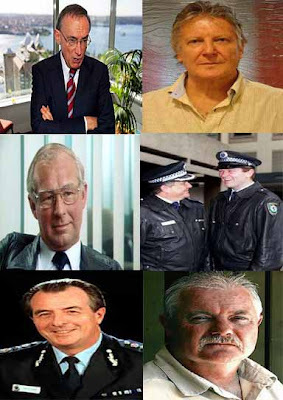 Even after and no doubt throughout the Royal Commission into Police Corruption. How does all this reflect on Justice James Wood? Should Justice Wood himself become the new Police Commissioner? SKIPPY: Is that the only way we can actually get the rust out of the Police Service?